In the race to create the ultimate package delivery system, several companies — most notably, Amazon (AMZN) — have been investigating and developing drones that could eliminate the need for humans in the last-mile leg of the shipping process. Starship Technologies, a London-based tech startup founded last year by Skype co-founders Ahti Heinla and Janus Friis, is the latest to hit the front page. Starship Technologies has been all the buzz this week thanks to the company’s reveal of a new delivery drone prototype. However, unlike the drones being developed by AMZN and Alphabet (GOOGL, GOOG), this particular model doesn’t fly. According to a press release by Starship Technologies, these drones will be environmentally friendly and have the capacity to deliver packages as large as two grocery bags. Their operating radius is expected to be 5 to 30 minutes from a retail outlet or local hub. Is Starship Technologies for Real? Well, it’s not April Fool’s Day, and considering that Heinla has been the co-founder of nine tech startups (including Starship Technologies), it looks like this is the real deal. Heinla said, “This is not rocket science. This is simpler to do than a self-driving car from a technological standpoint.” That may be true, and to an engineer the likes of Heinla this could seem like child’s play. But for the average consumer, a number of questions come to mind, more in fact than when AMZN first proposed delivery by drone. With AMZN drones and the Prime Air concept, the most complicated issues involve location accuracy, mid-air obstacles and FAA approval. Starship Technologies’ grounded drones, although able to circumvent the hurdles airborne drones face, have their own obstacles to overcome. Namely, theft comes to mind. Sure, there’s always the possibility that somebody could shoot an AMZN or GOOGL delivery drone out of the sky and steal the packages. But realistically, that likelihood is pretty small considering that the thief would have to first notice one of the drones, grab a firearm capable of shooting it down and actually make the disabling shot before the thing was out of rage, not to mention finding the downed machine later. Compare that to the difficulty faced by a would-be thief when encountering Starship Technologies’ drones. Since these robots will travel slowly on ordinary sidewalks, no firearm would be needed to disable the thing. Heinla didn’t mention if his company’s drones will come complete with futuristic self-defense capabilities. As far as securing the delivery in transit, Starship Technologies explains that only package recipients will be able to unlock the cargo via a special app. In theory, that sounds like a plausible, effective method … in a world where everybody is honest and ethical. With advanced GPS software and obstacle-avoidance technology, the Starship Technology drones could easily navigate city streets and sidewalks, but what about unforeseen obstacles such as ice or mud? 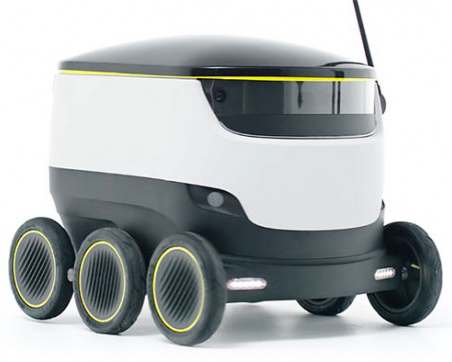 The thing doesn’t look too robust, resembling an iRobot (IRBT) Roomba on steroids than anything else. So I wonder, what would happen if it encountered ice, mud or even a puddle? I can’t picture those skinny little training wheel-like tires pulling it out of the muck or traversing a patch of ice. At least with the AMZN and GOOGL drones, terrain wouldn’t be much of an issue except during landing. Overall, the notion of ground-based package delivery drones is one that definitely has a future. However, at this early stage, I’d consider the Starship Technologies robot more proof of concept than anything else. Plus, there’s the massive army of FedEx (FDX) and United Parcel Service (UPS) drivers to contend with, and I doubt they’ll be very eager to get replaced by an oversized vacuum cleaner. There are simply too many unknowns for such a device to actually operate successfully, and the risks — both physical and financial — to all involved make the Starship Technologies drones useless for all practical purposes. That being said, however, this company is one to keep an eye on, because with an experienced CEO like Ahti Heinla there’s definitely a chance for revolutionary innovation around every corner.